The information here is meant to serve as a guideline for Operational and Logistics issues surrounding your program. Volunteers, securing the route, purchases and delivering services like signage and volunteers kits, it is all here. Keep in mind that every city is different, so this is meant to be more of a guide than hard and fast rules. Volunteers are the backbone of any Open Streets program. But where do you start? Where can you find volunteers? What tasks should each volunteer do? This tool will help you answer that question! Using the descriptions below and the accompanying graphic, you can easily calculate the minimum number of volunteers you will need at your Open Streets program. We suggest creating a master volunteer map of where each volunteer should be. Each Block Captain should have a volunteer map of the route segment they are responsible for. 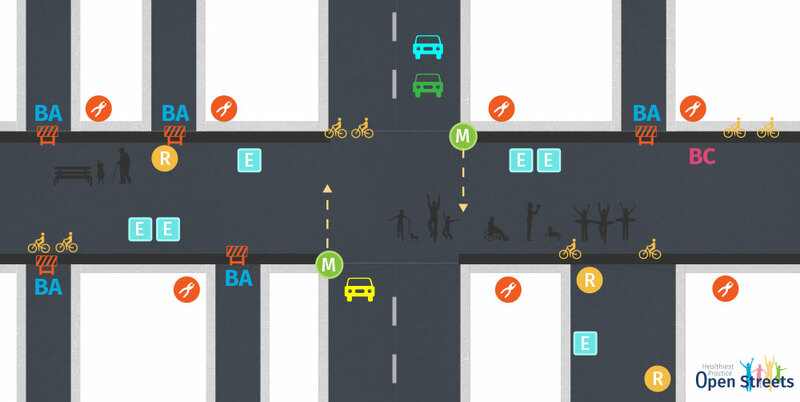 See our evaluation tool for ways to evaluate your Open Streets program​. Sometimes it’s challenging to find enough volunteers to staff your Open Streets program but anything is possible! Check out these innovative ideas to fill volunteer positions. Do you have an innovative way to recruit volunteers? Share it with us! And you need people on it (For more information on this check out our marketing tool! Contact your local municipally and authorities (police, EMS, fire) to determine necessary permits and plans required for your program. Develop volunteer plan—they play a key role in your traffic management strategy. Private EMS service/security service if necessary. Identify drivers for signage and material drop-off. Develop draft day-of Operations plan in collaboration with Operation Support staff. Inventory and organize purchased materials: Organize your materials by drop-off locations/route segments. Mark everything clearly. Charge walkie talkies. Tune to correct station and test transmission with team members. Check that everyone has written instructions and important contact information. Check-in with Block Captains and Roving Cyclists. Review duties. Check-in with road-closure team/company for status update. Check-in with Operation Support Staff and Block Captains at least once an hour to offer support, guidance. Take a deep breath and try to find a moment to soak in the moment. Check-in with road-closure team/company in preparation for program end. Survey entire route to ensure it is accessible to traffic and all barricades have been picked up. Survey entire route to ensure signage and materials have been picked up. Document issues and areas for improvement for your next program date.